No matter how successful a company becomes, when it’s founded and focused on family, it won’t forget where it came from. In the early 2000’s, two father-and-sons teams, BLUE Buffalo and DesignCentrix, were starting two different businesses. Both companies were looking to make their own way in their respective industries, not knowing that they would somehow meet in the middle to form a symbiotic relationship that continues to flourish today. BLUE Buffalo was founded by Bill Bishop and his two sons in 2003. The family started the company in their barn with the goal of creating a healthy, natural dog food for their family dog, Blue, who was facing a variety of health issues. At the time, natural dog foods were only available in mom and pop shops, but they wanted to make nutritious food available to more consumers. After a trial run in a major pet food store, their line took off. Today, BLUE Buffalo is the number one brand of natural pet food at Petco and PetSmart. DesignCentrix got the opportunity to work on their first BLUE trade show exhibit in 2006. This humble 10’x20’ inline was a simple but sturdy design that was well utilized in their early shows. 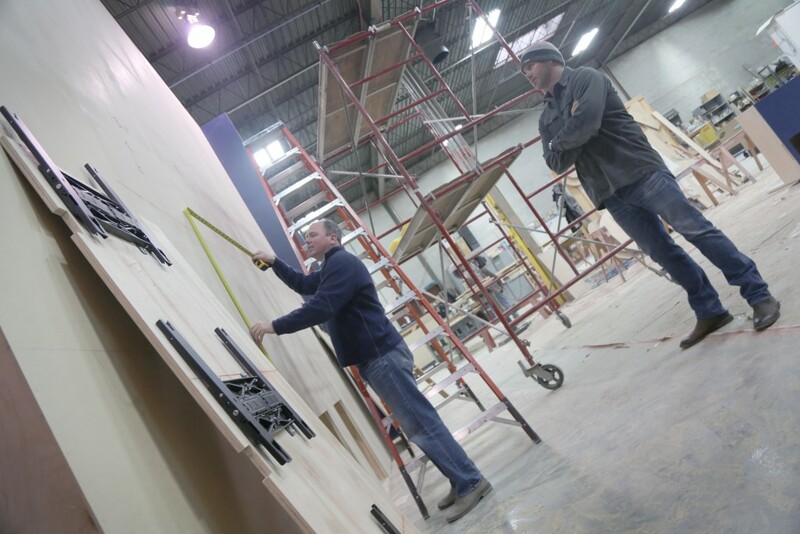 As BLUE’s business continued to grow, so did their booth size, moving to a 20’x20’ island with a second floor to an impressive 30’x50’. Each design was modular, allowing them to expand on each previous exhibit without needing to start from scratch. The success of these early exhibits allowed their partnership with DesignCentrix to naturally progress and grow alongside their business, eventually becoming solidified into what it is today. This year, BLUE Buffalo attended Global Pet Expo in Orlando, Florida on March 4th through the 6th. This Expo is the pet industry’s largest annual trade show featuring the newest, most innovative pet products on the market today. 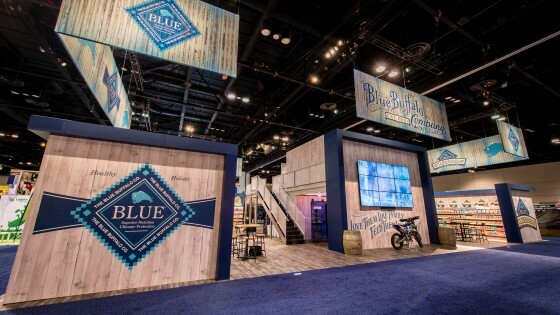 BLUE wanted to go all out to showcase their four major brands, BLUE Life Protection Formula®, BLUE Freedom®, BLUE Basics®, and BLUE Wilderness®, in a store-like setting to give retail partners an idea of what BLUE products will look like on their shelves. 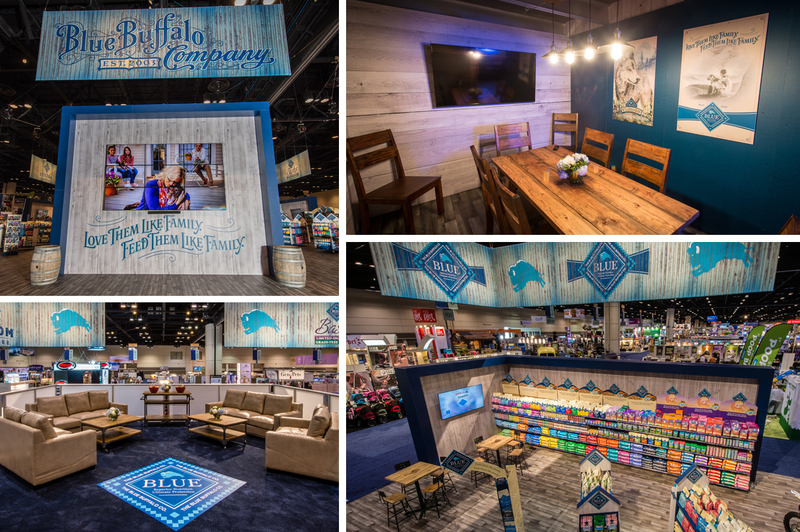 To do this, they took up the most real estate yet — a two floor, 60’x80’ exhibit — to expose themselves as an industry leader in natural pet foods. After collaborating on multiple concepts and renderings over a one and a half month period, they decided to go back to their roots with a rustic, barn-like setting with a weathered feel. The DesignCentrix team got to work, creating an innovative and architecturally interesting space to fit their style. BLUE also wanted DesignCentrix to incorporate one large and two small conference rooms where they could present to potential buyers within the double deck structure. Keeping with the rustic feel, they used more relaxed, comfortable seating and furniture as opposed to the traditional conference room effects. Because of the great brand they’ve built up over the years, the conference rooms were booked for all three days long before the show opened. Another feature in their exhibit was a three by three video wall with nine 55” digital displays. These screens showcased their top brands in a visually appealing format. To complete the look, the walls of the booth were wrapped in seamless, digitally printed wood paneling.